"I don't need you. Because you're useless now." The Japanese card of the day is one of the rebel Shadow Paladins from G-BT03: Sovereign Star Dragon, the Contemptuous Knight Ghiva. A single rare support card for Claret Sword and Aurageyser Dragon, Ghiva revives the skill of Skull Witch Nemain from BT04: Eclipse of Illusionary Shadows as a generation break. In exchange for her slower startup time, Ghiva has a higher base power that can form a 16000-power lane with either a grade 1 superior called by Claret Sword, or with the 9000-power booster Hard Fighting Knight Claudas. Unlike other draw support cards Starlight Hedgehog and Flying Librarian, Ghiva's 7000 power base actually prevents her from forming a 16000-power column with Black Sage Charon or Diligent Knight Matholwch. Night Sky Eagle from the same set becomes an 11000-power grade 1 in the turn that it's called, and this card can be used to make Ghiva jump over the 16000-power threshold, but her low base power relative to the type of skill she carries brings with it several obstacles to Ghiva's success. 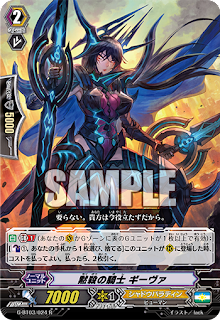 AUTO: Generation break 1: [Counterblast 1, choose a card from your hand, discard it] When this unit is called to a rearguard circle, you may pay the cost. If you do, draw two cards. As a whole, Ghiva's base power is not quite high enough compared to Nemain to justify the generation break conditions. Unlike Flying Librarian, there are no conditions under which Ghiva will countercharge the damage she counterblasted. 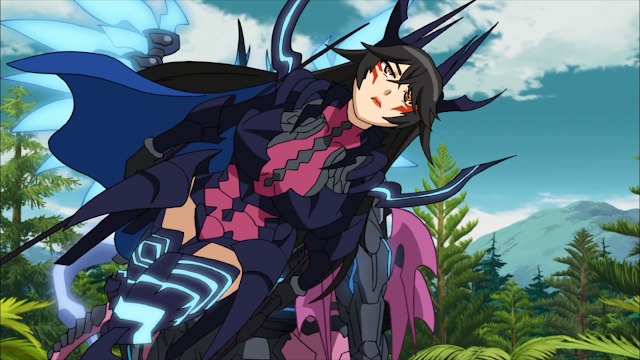 Moreover, one of the primary reasons to run Nemain in the original Shadow Paladin deck was that if a grade 1 and 2 were already in hand, Nemain could be kept in the opening draw instead of redrawing her because she filtered through more cards than would have been seen had she been sent back to the deck. Because Ghiva requires being at generation break before she can be used, she has zero early game utility and the primary benefit of her 7000 power base is being marginally less weak than Nemain while defending. This is a dubious benefit. The difference between 3000 and 7000 power is the difference between being assailed with trigger units versus grade 1s, and it also means that 10000-power subclan attackers like Transient Revenger Masquerade only require 5000 rather than 10000 shield to block. But in the present generation break format, subclan attackers are generally run by just two decks--Phantom Blaster “Abyss” and Thing Saver Dragon. While those decks do account for a significant portion of professional play, neither of them want to commit a large number of trigger units to the field versus Shadow Paladin decks because of the danger of being hit with a “Diablo” stride and not having the hand to block it. Moreover, Thing Saver's subclan attackers are not effective early game because they are Jewel Knight subclan attackers that require a nearly-full field to function. Thus the primary disadvantage to running Nemain (riding her) has already been negated by aspects of gameplay endemic to the LD01-on format. The general reluctance to commit field at a fast pace versus any deck running the “Diablo” stride enables weaker cards like Nemain to function, as opponents have next to no hope of playing short games versus Shadow Paladin decks. Both units synergize strongly with Aurageyser's Ildona-like skill, albeit at the disadvantage of costing counterblast in an already counterblast-intensive deck. Of the two, Nemain is the much more effective card in the early game, where her primary role is to fix bad hands and trade trigger units for useable rearguards while also getting the cards in hand you need for your stride combos. However, she's considerably weak in the mid to endgame, where her 3000 power base works against her even with Claret Sword's power bonus on her booster. Ghiva is more effective at forming real lanes that can draw 10000-and-greater shield out of an opponent. The cards do not have to be mutually exclusive to one another. Running the minimum number of Nemain to help secure initial setup can help sustain Claret Sword, and from there on out a playset of Ghiva can take over once your generation breaks are online. Ghiva has also been subject to a widespread mistranslation. Originally propagated by the Cardfight Wiki, and likely owing to putting her name through Google Translate, this translation comes from interpreting mokusatsu (黙殺) as "smother," However, the smother translation comes from a dictionary definition "smothering a conversation." The real meaning of mokusatsu is akin to the phrase "I won't even dignify that statement with a response." It is a silence that indicates refusal to comment on something, rudely stoic behavior, and holding a statement in contempt. Ghiva's counterpart in this regard is Knight of Silence Gallatin, who is instead chinmoku (沈黙) indicating reticence and taciturnity. (Note that mokusatsu and chinmoku come from the same root word moku 黙) At her best, Ghiva is a Silent Knight; at her worst, a Contemptuous Knight.